A complete up-to-date list of all my publications can be found at my arXiv and Google Scholar pages. N. J. Laurita et al. Phys. Rev. Let 114, 207201 (2015). Theoretical models of the spin-orbital liquid (SOL) candidate FeSc2S4 had predicted this material to be in close proximity to a quantum critical point separating a spin-orbital liquid phase from a long-range ordered magnetic phase. 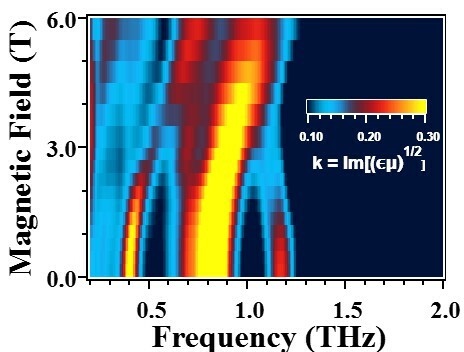 In our research, we examined the magnetic excitations of FeSc2S4 through time-domain terahertz spectroscopy under an applied magnetic field. At low temperatures an excitation emerged that we attributed to a singlet-triplet excitation from the SOL ground state. The triplet character of this excitation was confirmed by an observed three-fold splitting as a function of applied magnetic field. Using experimentally measured parameters and existing theoretical models, we determined FeSc2S4‘s proximity to its quantum critical point and estimated that the characteristic length of the singlet correlations to be 8.2 in units of nearest neighbor lattice constants - establishing FeSc2S4 as a SOL with long-range entanglement. N. J. Laurita et al. Phys. Rev. Lett. 119, 227601 (2017). The symmetric splitting of two spin-wave branches in an antiferromagnetic resonance (AFR) experiment has been an essential measurement of antiferromagnets for over half a century. In this work, circularly polarized time-domain THz spectroscopy experiments performed on the low symmetry multiferroic hexagonal HoMnO3 reveal an AFR of the Mn sublattice to split asymmetrically in an applied magnetic field, with an ≈50% difference in g-factors between the high and low energy branches of this excitation. Theoretical calculations demonstrate that this asymmetry is only reproduced if quartic spin interactions are also included in the spin Hamiltonian. 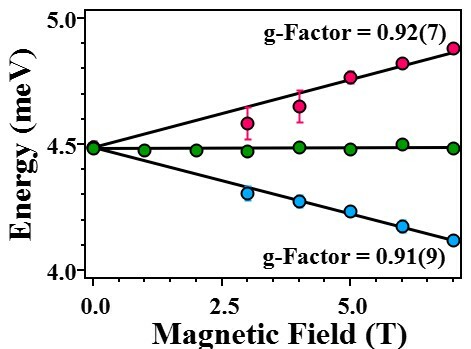 Our results provide a paradigm for the optical study of such novel interactions in hexagonal manganites and low symmetry antiferromagnets in general. N. J. Laurita et al. Phys Rev B 94, 165154 (2016). Recent theoretical calculations suggest that SmB6 may be the first topological Kondo insulator (TKI) and propose that residual dc conductivity observed at low temperatures is due to topological surface states which reside within the Kondo gap. Here, we investigated the low energy optical conductivity within the Kondo gap of single crystals of SmB6 via time domain terahertz spectroscopy. We uncovered significant three-dimensional bulk conduction originating that is many orders of magnitude larger than any known impurity band conduction. Additionally, the well-defined conduction path geometry of our optical experiments allows us to show that any surface states, which lie below our detection threshold if present, must have a sheet resistance of Rs ≥ 1000 Ω.